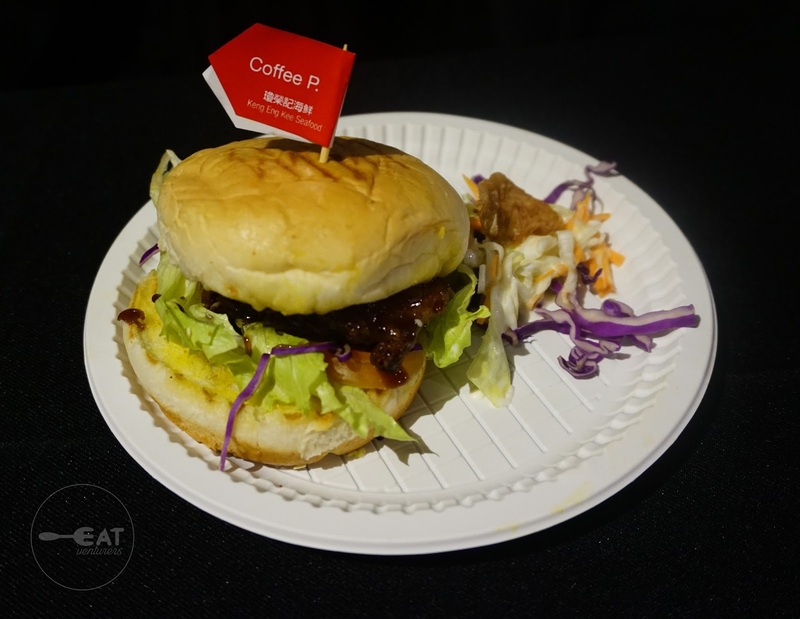 From Singapore, The Eatventurers tried the Coffee Pork Ribs Burger and Curry Chicken Burger of Keng Eng Kee. Keng Eng Kee is a business owned by siblings, Wayne, Paul, and Geraldine. It was established by Chef Liew Choy in the 70s until he later on passed the business to his children. The siblings wanted to make their burgers different. The Coffee Pork Ribs Burger is a very interesting take on a burger. However, the taste was very similar to a local coffee candy here in the Philippines. The Curry Burger is a good choice in our view. They incorporated the curry flavor into their burgers. 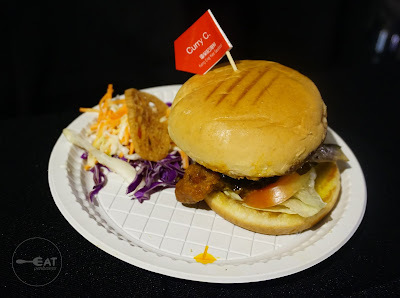 There are a lot of people who love curry, and a curry burger isn't common. From India, The Eatventurers tried Aloo Tikki of Mangla Chaat. 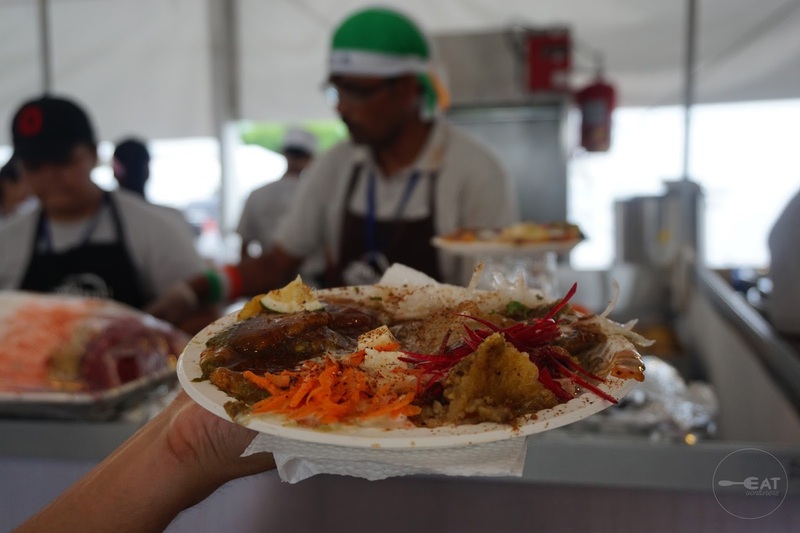 According to WSFC, Mangla Chaat had its humble beginnings from a food stall in Old Delhi, where Dalchand inherited his skills from his father before he opened the establishment. We find Aloo Tikki as one of the perfect representations of Indian street food as it tasted authentic with its strong Indian spices. Aloo Tikki is an Indian croquette made of potatoes, onions and different spices and lentils. It is served with sweetened curd, coriander and tamarind chutney. It might be a little spicy for some but it is definitely worth the try. Squeeze some lime for an even more awesome experience! This is the Eatventurers' choice. 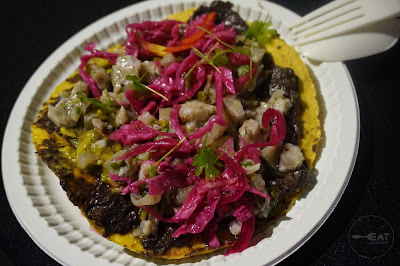 From Mexico, The Eatventurers tried Pork Trotters with Black Bean Tostadas of Pasillo De Humohas. Pasillo De Humohas is a brainchild of Chef Alam Mendez. WSFC said Mendez, who started his career in family business in Oaxa, Mexico 25 years ago, just wanted to share the traditional food from his hometown. Mendez offers fish tacos and pork trotters with black bean tostadas at the WSFC 17. These give you authentic an taste of Mexico. The pork trotters' ingredients, which seemed mostly coming from Mexico, are perfectly matched with each other. There is some tangyness that cuts through the fat. Unfortunately, The Eatventurers would've liked more meat and less fat. It is very similar to our very own sisig. The black pasty-like spread (black beans) of the tostadas is probably the most interesting component of the dish. From Indonesia, The Eatventurers tried the Balinese Pork Ribs dubbed "Warung Sunset." It is made by Indonesian chef and master of Balinese traditional herbs and blends, Chef Yudi. He made this dish popular at the Sunset Café in Bali. This was highly recommended to us by our friends in the event. It had a great flavor and don't get us wrong, we also loved this dish but we felt that it needed more sauce, or rub, so we didn't enjoy the dish that much as we thought we would. It also would be better if they served them hot, or warm. We're not expecting these to be served fresh from the grill, it would be better if it was served from a food warmer though. For this dish, Chef Yudi uses baby back ribs marinated with Asian spices and then roast it over charcoal fire. It is served with a spicy salad. From Vietnam, the Eatventurers tried Bahn Xeo or Bánh Xèo MiẾu NỔi by Chef Nga. Chef Nga's family business started by selling it with a heavy food cart pole on her shoulders and offers her specialty in her town. The dish has been popular for about 20 years now. Chef Nga initially thought of selling it to make a living for her large family now her children are beginning to inherit her business and is looking into expanding the business worldwide. Banh Xeo is a crispy rice pancake with meat, seafood, mung beans, and sprouts. It is served with fish sauce and sometimes with chili sauce. 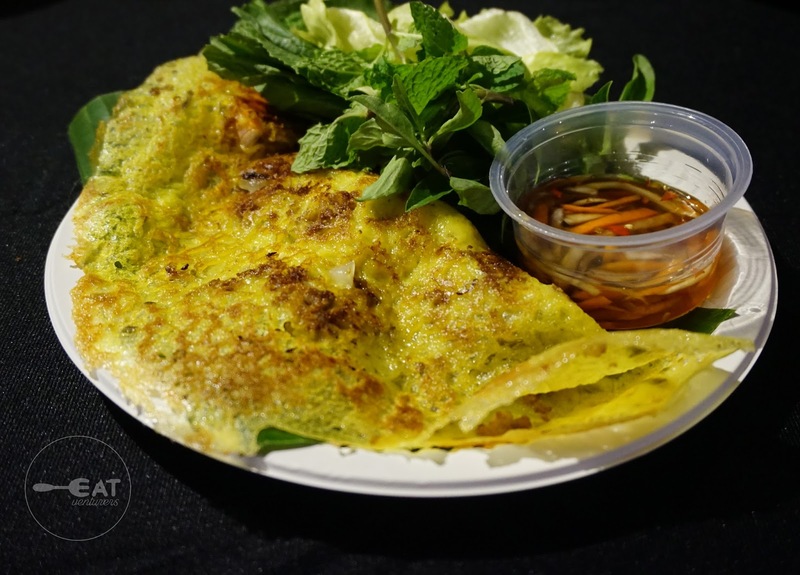 The traditional way of eating Banh Xeo is you get a portion of the crispy rice pancake, wrap it into a leaf, usually lettuce, and sometimes sesame, then add mint leaves, dip it into the sauce, and enjoy. The crispy rice pancake was crispy on the sides and very flavorful. The sauce also helped in elevating its flavors. 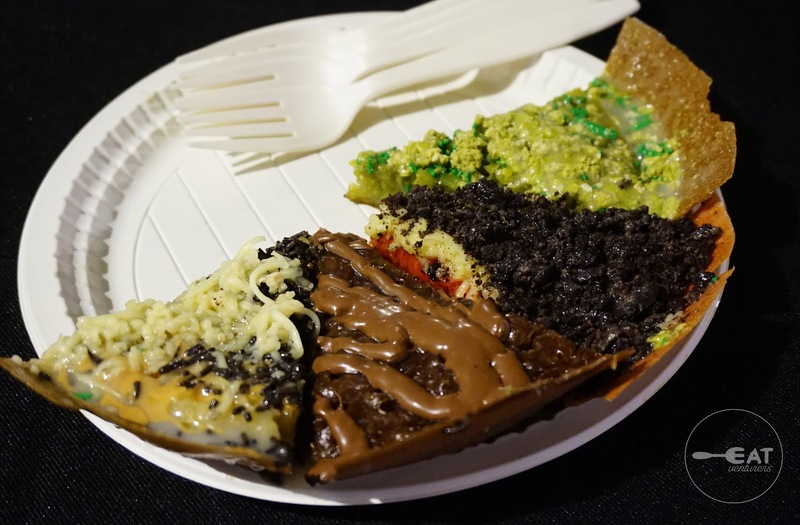 Also from Indonesia, The Eatventurers tried Martabak Manis “San Francisco” by Mr. Buyung. This dessert is a recent variation of sweet martabak or appam balik or the Chinese mee chang kueh, according to WSFC. Bong Kap Kap Djun started popularizing this snack in 1965 in a street stall until he renamed the specialty as Martabak San Francisco in 1967. He doesn't use yeast and artificial sweeteners for this. This is one of the bestsellers, if not the bestseller, in the whole World Street Food Congress 2017. And they are planning to branch out here in the Philippines! You guys better watch out! It has a crunchy crust, and had a texture of pancake, but cut like a pizza. It was described by WSFC as having "crispy edges and soft gummy body." This Indonesian bombshell has different flavors and different colors for an Instagram-worthy dish. They've got four flavors: Kit Kat Green Tea, Nutella Almond, Cheese, and Chocolate Red Velvet Oreo. The Eatventurers loved the Kit Kat Green Tea. It is a taste of heaven in every bite. The crispy crust is the best component of this dish. Last but not the least is Philippines' very own twist of Kare-Kare Palabok by Chef Sau del Rosario. 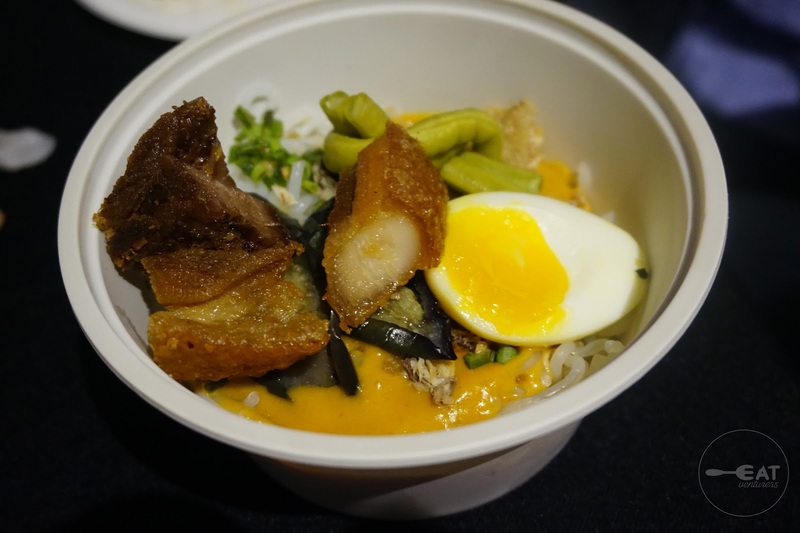 Chef Sau reinvented palabok's sauce and used kare-kare's peanut stew, topped with crispy pork belly, boiled egg, and greens such as the usual string beans, egg plants, and spring onions. We truly loved the idea of this dish along with Chef Sau's sisig paella so it was non-negotiable for us to try it. However, although we loved the idea we felt that due to anticipated number of customers they only served small portion of sauce making it bland. We would have loved it if the serving of peanut sauce was generous. For drinks, The Eatventurers tried Makansutra's Bandung. The Eatventurers has tried it before at the Makansutra hall in Mega Mall. 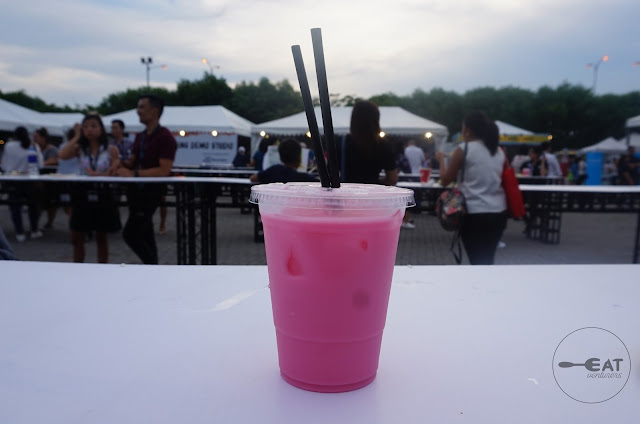 It is the pink-colored drink you'd see most people are toting inside the concert grounds. The drink named after Indonesia's West Java City, Bandung is composed of milk evaporated and condensed partnered with coloring and essence rose cordial syrup and iced cubes. It is refreshing to drink and perfect for those who like milk tea. Those are all the eight dishes and a drink The Eatventurers tried at the WSFC 2017. Other dishes to try: Chef Michelle Adrilliana's Kalderetang Ramen, Oyster Omelette of Taiwan, Bicol Express Risotto, Pork Mongo (President Rodrigo Duterte's favorite), Herencia's Longganisa Bagnet Pizza, Chef Sau Del Rosarios's Sisig Paella, Chef KF Seetoh's Nasi Lemak, Bahn Beo & Bahn Log, and many, many more! 1) Save seats / tables prior to ordering - A lot of people are coming and going so you have to see to it that you secured your space for dining. 2) Make a quick round and review the stalls - This will help you see which stalls have long queue, and you'll get to decide your choices easily. 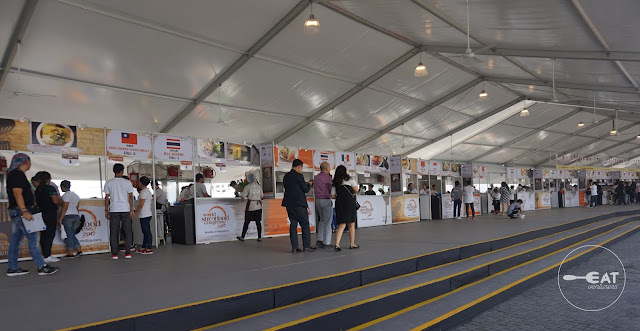 3) Save the drinks for last - There are express lanes for water but if you're planning to get beer or other drinks the lines are not as long as the food stalls. Also a heads up, drinks are quite expensive so if you want to save some bucks, drink a lot of water before going in. Outside food and drinks aren't allowed inside. 4) Gear up - Since the venue is open air, expect it to be hot. Be prepared also for the occasional rain and bring umbrellas as not the whole venue is roofed. You may also bring your trusted cap or fan. 5) Invite your friends - You can try more food and save on cost when you invite your friends to this event. They can line up individually while you save the seats for them to save time. Entrance fee is P150 (consumable) and the prices of food starts at P150. Yes, we agree that the prices are steep. 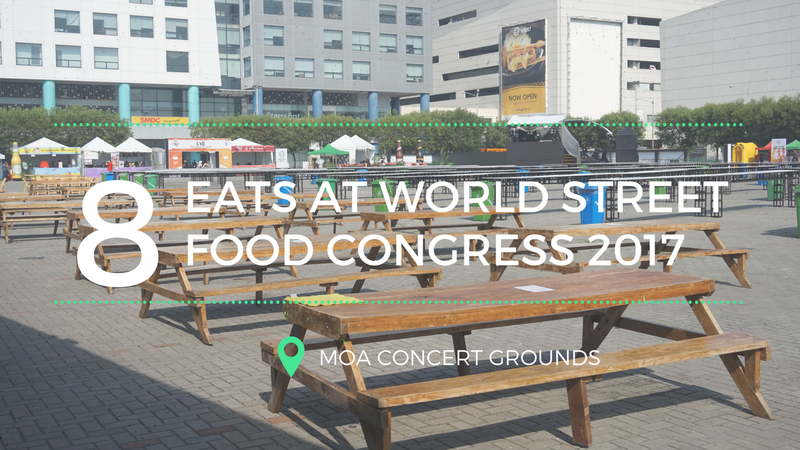 However, please take into consideration that these participants of the World Street Food Congress 2017 came from different countries. They spent airfare and transported some, if not most of their ingredients. You can also assume that the street food you are eating followed the basic safety and sanitation standards as the stall assistants are mostly culinary students. They take several hours of preparation before they could serve several people. The venue is MOA Concert Grounds. Need we say more? 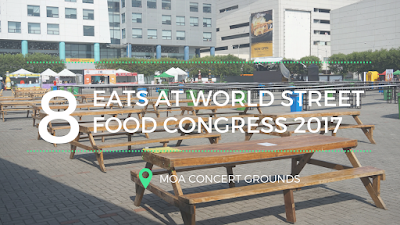 We would like to congratulate World Street Food Congress for a very successful event. They improved a lot from last year's event. It is now well-organized in our opinion. It has a bigger venue too! Is it worth the visit? We say yes! Watch our teaser video, here: Teaser video.